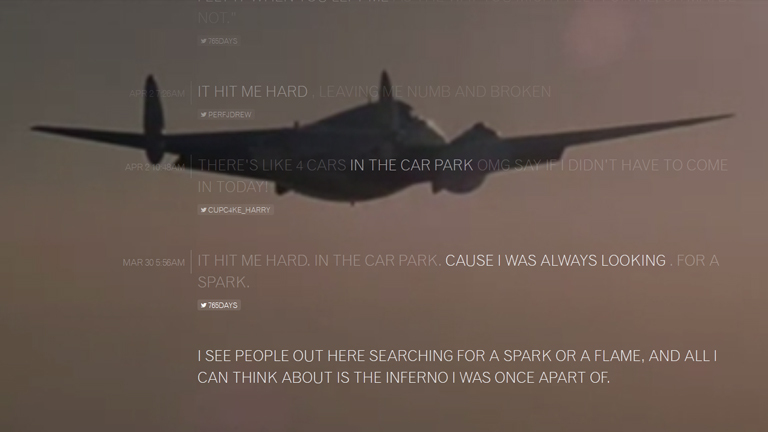 Live Twitter powered music video for Brightly, super-imposing tweets over stock images related to airplanes and flying. In order to be picked up, the tweets need to feature parts of the song’s lyrics, but the context can be totally different, making the video fun to watch repeatedly. The interactive promo is part of a bigger crowdsourced project where people are invited to share the Preflight Nerves track (which they get for free once registered) among their social networks‘ connections. If they get ten of their friends to register using the provided code, they are rewarded with the entire album for free. Quite a Bright strategy! Not a fan of interactive vids? Watch the linear version here! Live Twitter powered music video for Brightly, super-imposing tweets over stock images related to airplanes and flying. In order to be picked up, the tweets need to feature parts of the song’s lyrics, but the context can be totally different, making the video fun to watch repeatedly. The interactive promo is part of a bigger crowdsourced project where people are invited to share the Preflight Nerves track (which they get for free once registered) among their social networks‘ connections. If they get ten of their friends to register using the provided code, they are rewarded with the entire album for free. Quite a Bright strategy! Not a fan of interactive vids? Watch the linear version here!